Our country has often been identified with the phrase “United we Stand,” yet at the beginning of the recent bipartisan Congressional baseball game we saw a different picture. The familiar hateful rhetoric between the parties was paused and quieted for a moment. It had been so horribly shocking the day before to hear the news that a gunman was shooting at defenseless members of Congress who were practicing for an upcoming annual bipartisan fundraiser baseball game in Alexandria, Virginia. Apparently, this shooter had been living in his car for some time, watching the practice games, and waiting for Republicans to be on the field early that morning so he might carry out this horrid deed. The shooter fired incessantly for ten minutes, and one bullet went through the hip of GOP House Whip Steve Scalise, injuring internal organs. He has already undergone several surgeries. This is a husband and a father of 8 and 10 year old children. Look up photos of him and his family. They could be your neighbors. Thankfully, because of his leadership position, Congressman Scalise was accompanied by armed Capitol Hill police, who shot back and apprehended the gunman. Otherwise, there is no telling what the ultimate outcome would have been. Because of the frequency of shootings, our country could easily be fairly unmoved and apathetic by this one episode in a series of so many others. Or we could use it as more motivation to say how horrible “the other side” is for one reason or another and that if “they” hadn’t done such and such, this wouldn’t have happened. For the moment, there has been some talk about how we need to work together and stop the hateful rhetoric and actions that advocate violence. Much can be said for efforts to promote a spirit of unity, words of kindness and compassion, speaking the truth in love, and a little civil discourse to replace the seemingly constant barrage of rude interruptions and insults. All of these are thoughts to consider and take to heart. 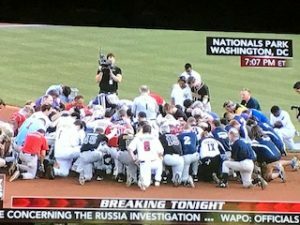 Turning to God on our knees as the bipartisan players did before the Congressional baseball game is definitely the most powerful option! Before our Almighty God….United we kneel. Maybe a good motto for us.